GO See Art in Brooklyn This Weekend! As some of you know, for the past few months I’ve been working on GO, a borough-wide, community-curated open studio event organized by the Brooklyn Museum. After months of planning, preparation and outreach the open studio weekend is upon us! This Saturday and Sunday, September 8th and 9th, over 1,700 artists with studios all over Brooklyn will open their doors to you from 11 am to 7 pm. I am so excited about GO because it showcases the diversity of artistic talent that Brooklyn has to offer. It also gives viewers the chance to see art in places they never knew artists were working, whether that’s under their nose in their own neighborhood or farther afield. I’ve been working as the neighborhood coordinator for my beloved neighborhood, Sunset Park, where 160 artists will open their studios! I knew artists worked in the neighborhood, but I’ve been so pleased about just how many artists there are and how many want to participate in GO. It’s been a wonderful opportunity to think about how we can continue to promote art in Sunset Park as a group and our first small step is a Tumblr page, Sunset Park Artists, for participating artists to share images of new work and work in progress. There’s also two fantastic nonprofits, Chashama and the New York Art Residency and Studio Foundation that offer artists affordable studio space, and many artists with studios in these buildings are participating. I’ve also put together a Sunset Park guide of places to eat and hang out before, after or during seeing studios. Why not make a weekend out of coming to Sunset Park? All of these sites give you a little taste of what you will find here in the neighborhood! 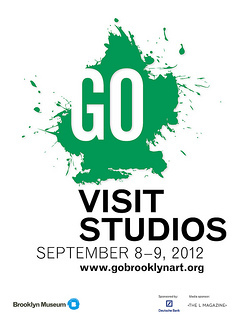 To learn more about participating in GO as a viewer and voter, search neighborhoods and explore the profiles participating artists visit gobrooklynart.org. If you want more information about Sunset Park artists stop by the Green Fig Cafe on Saturday or Sunday between 11 and 3 and I’ll give you all the information you need to get out and see art. See you in the studios!